If you are over the age of 35, you probably like working to achieve a goal, you tend to rely on self to get things done and you like structure. The next generation is different, just as we are different to the baby boomers. The next generation like to multi-task, are entrepreneurial and like to undertake socially meaningful work in a participative environment with other like-minded people. The Australian Government has recently invested $14,934,000 into Farming Together, a two-year Farm Co-operatives and Collaboration Pilot Program to lift the lid on on-farm profitability by boosting collaborative groups, co-operatives and collective bargaining. Young and old farmers alike are designing new creative ways to work together, support each other and accom­plish stronger farm profits and stronger communities. Whether they’re forming buying groups to secure supply and volume pricing, marketing a branded product, securing selling channels or accessing machinery, land or capital, farmers are being encouraged to realis­e the benefits of sharing. 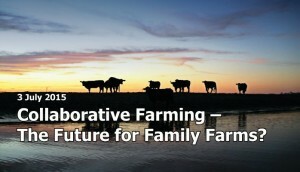 Co-operative and collaborative farming can be generally defined as working together for mutual benefit. Australian agriculture has a rich history of co-operatives and collaboration including Norco, Birchip Cropping Group and Bulla Burra. Growing products that are differentiated in quality, farming practices, community values and environmental benefits to meet the growing markets for different consumer segments. Farmers that live in similar regions or that grow similar products tend to face common challenges. By working together, groups are able to create solutions to problems that deliver a multitude of benefits. There is no one model for co-operative farming. There are a range of models including separate businesses working collaboratively, or one business formed as a co-operative. Farmers can share land, farm as neighbors, or farm together in a community or a region. The Farm Co-operatives and Collaboration Pilot Program is assisting Australian Agriculture to design their own tools and methods to match scale and depth of reach. There is funding available for new or existing groups to enhance their ability to farm together.